Forum Index > Historical Arms Talk > Evidence for Brigandine Caparison? Posted: Sat 03 Sep, 2016 7:17 am Post subject: Evidence for Brigandine Caparison? 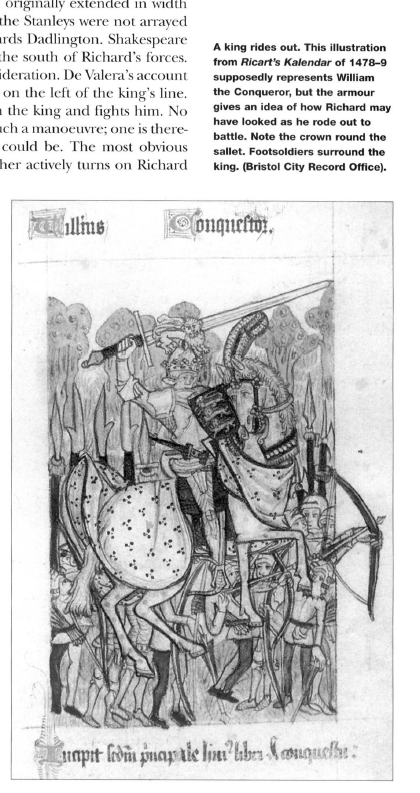 I was reading a book about the War of the Roses and I came across a late fifteenth century's illustration representing the Duke of Normandy. Although he certainly didn't wear such armor, I found it curious how the artist made the horse's armor. My questions are: is there any evidence for the use of brigandine bardings? If there aren't, it's nonsense to have a barding made of brigandines? What makes you think it is brigandine horse armor and not just a regular cloth horse cover? I think it's just cloth. First, the pattern on the cloth is too sparse to be brigandine rivet heads. Second, the folds in the cloth wouldn't be possible if it was armour. Figure 3 in http://www.metmuseum.org/art/metpublications/..._1480_1620 shows a horse with a patterned cloth cover over mail. where there are no plates, only rivets. This suggests that the Chinese used brigandine horse armour, but I haven't seen any surviving examples. Def cloth. Can't think of any evidence for brigandine barding.